Celebrating St. Patrick's Day is all about traditions — like eating corned beef and cabbage and wearing green. But let's make sure another St. Patty's staple — drinking Irish beer — doesn't put you and others at risk by ensuring you have a sober ride home. Since 2013, there have been a total of 149 crashes on St. Patrick's Day in Pennsylvania, according to preliminary PennDOT data. Of those, three resulted in fatalities. Nationally, 60 people lost their lives in drunk-driving crashes over the St. Patrick's Day holiday, reported the National Highway Traffic Safety Administration. In addition to the potential impact on your safety and the safety of others, driving impaired could have a huge effect on your wallet. Getting a DUI can cost you thousands of dollars in traffic fines, legal fees, increased insurance costs, and more. 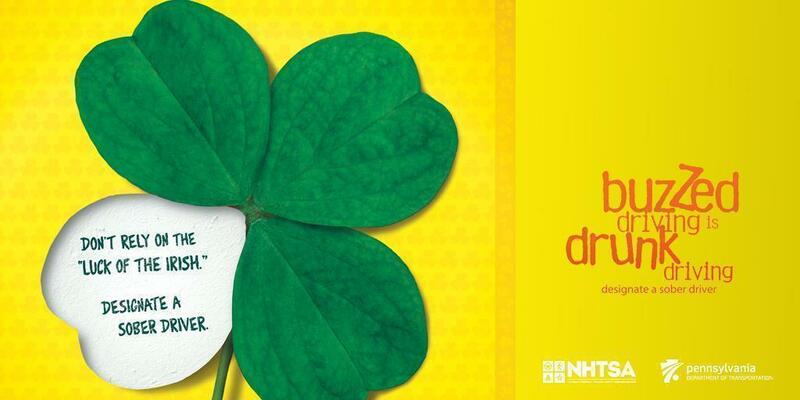 Don't rely on the luck of the Irish to get you home safely after a night of celebrating. Designate a sober driver, or scope out your public-transit options beforehand. You can also download the free SaferRide app on Android and Apple devices from the Google Play or iTunes stores. Once downloaded, the app provides three simple options to a user: review and call taxi services available in the area, call a contact programmed into the app in advance, and view a map of the user's location. For more information on impaired driving, visit www.penndot.gov/safety. Follow PennDOT on social media — Facebook, Twitter, and Instagram​.